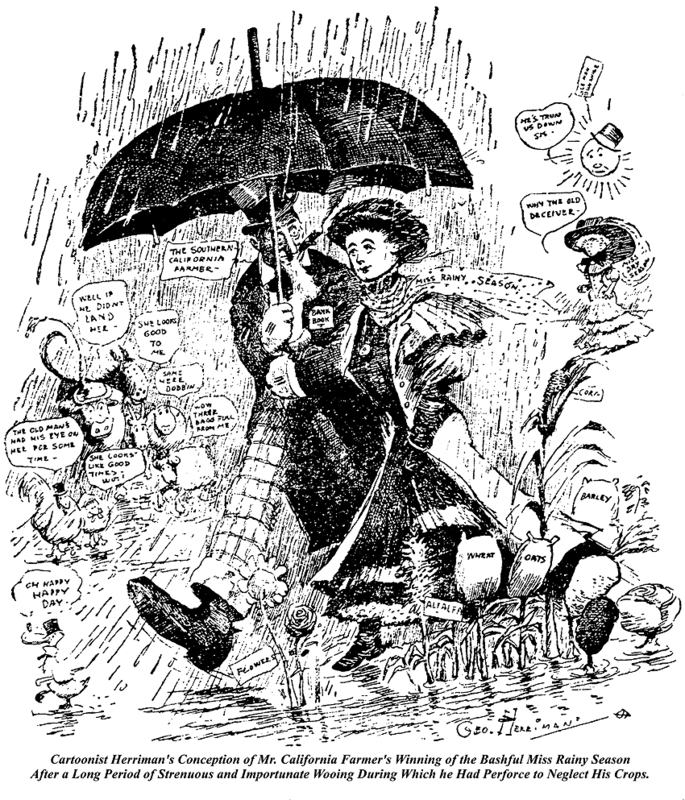 Monday, January 27 1908 -- Herriman comments on the arrival of California's rainy season. A torrential storm had drenched the California coast with up to three inches of rain in the past few days.Note the duck in the lower left, looks like a Gooseberry Sprigg prototype. Sorry for the quality of this one. Between a badly printed source paper and scratched-up fuzzy microfilm, I threw in the towel pretty early in the touch-up process. As beloved as the famed character Baron Munchausen is, and in public domain to boot, it seems odd to me that his adventures have only once been adapted into a comic strip. Oh sure, there have been plenty of features that had similar characters who told outrageous self-aggrandizing lies, but never did anyone seem to want to dip into the original well. Well, if it could only be done once, then it's nice that it was done so well. Klaus Nordling, at the very beginning of his cartooning career, did Baron Munchausen as a weekly strip for the tiny Van Tine Features Syndicate. Klaus was barely twenty years old when he tackled the assignment, but his storytelling and artwork were already top-notch. Nordling's appropriately over the top tall tales are accompanied by deliciously witty, highly polished art. No big surprise that Klaus became one of the leading lights of the Golden Age of comic books when he switched over to that genre a few years later. 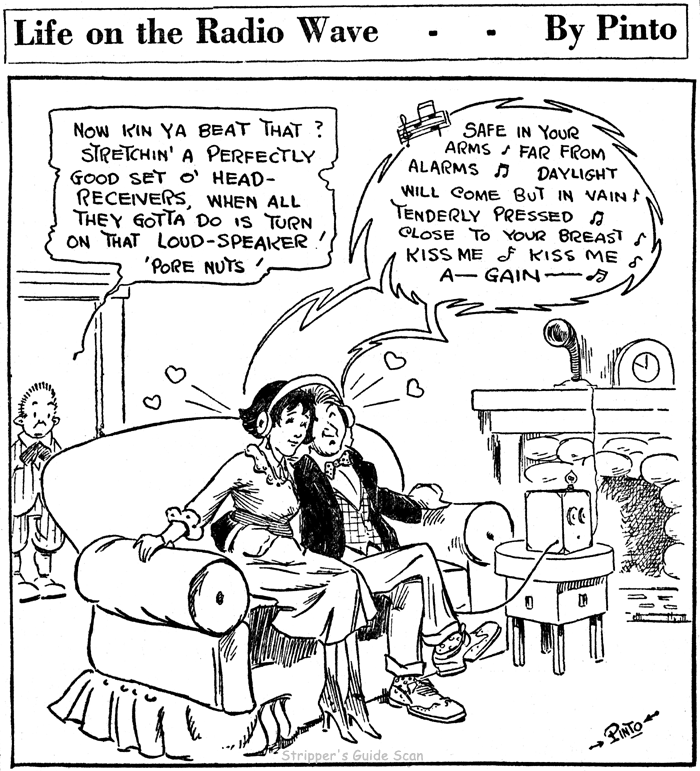 The strip ran from 1935 (starting before October 14th of that year, my earliest example) and ran until sometime in 1937, probably ending early in that year. Nordling's early comics work is atrocious and amateurish. 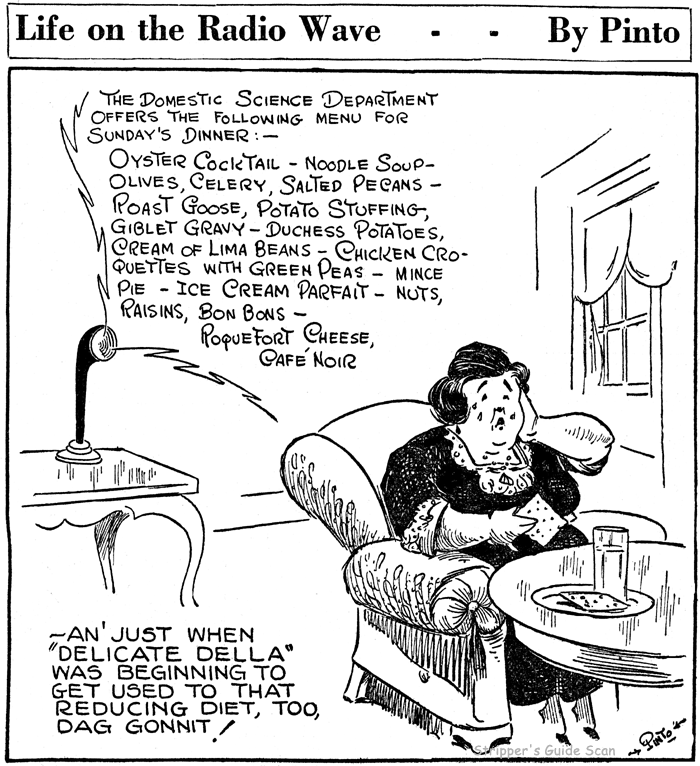 Around 1942, it suddenly becomes polished and nuanced--as are these 1935 strips! I wonder why Nordling chose to lower his artistic standards so brutally in the later 1930s? Well, he did have a week to produce each of these strips, a far cry from the production line environment of comic books, where, what, a page or more a day was the norm? British cartoonist Dennis Gifford, whom you may know from his various books on the history of comics, drew an adaptation of Munchausen for the British editions of Classics Illustrated (#146). Comic book database has the cover but no other information, not even actual date which i think was late 1950s. I am a big Nordling fan. Where did you get the information he is Fred Nordley? I immediately had a look to find some more and was surprised to see samples ran until februari 1939. But, since at least one of those was one I did see two years earlier, my guess is these are reprints? Klaus Fjalar Nordling was born in Pori, Finland on May 29, 1910 according to a family tree at Ancestry.com. He was the only child of Gustaf Ribert and Aili Karoliina. The family sailed aboard the S.S. Oscar II from Copenhagen, Denmark on August 22, 1912; they landed in New York City on September 3. Nordling's father was a self-employed photographer as recorded on his World War I draft card. They lived at 4213 8th Avenue in Brooklyn, New York. The Nordlings were recorded in the 1920 U.S. Federal Census at the same address. Nordling's father had been in the U.S. since 1903. In 1930, they lived at 4015 7th Avenue in Brooklyn. Nordling's first name was recorded as "Frank" and his occupation was a clerk in the diplomatic industry. and had a deep and life-long love of nature and the outdoors. mid-1940s to Florida Hill Road in Ridgefield [Connecticut], where Mr.
Nordling worked at his home studio. According to Who's Who in American Comic Books 1928-1999, Nordling began his career as a gag cartoonist and caricaturist for Americana Magazine in the early 1930s, and then produced Baron Munchausen in the mid-1930s. The late 1930s saw his entry into the comic book field. An overview of his comics career is at Wikipedia; a list his comic book credits is at the Grand Comics Database. During the mid-1950s the newspaper, Bridgeport Telegram (Connecticut), reported on his theater work as an actor and director. Nordling passed away on November 19, 1986, in Ridgefield, Connecticut, according to the Connecticut Death Index. Nordling himself in Alter Ego #60 claims it as his work. Where did you find the strip appearing later? It should indeed be reprints, but I'd like to check it out if its online. 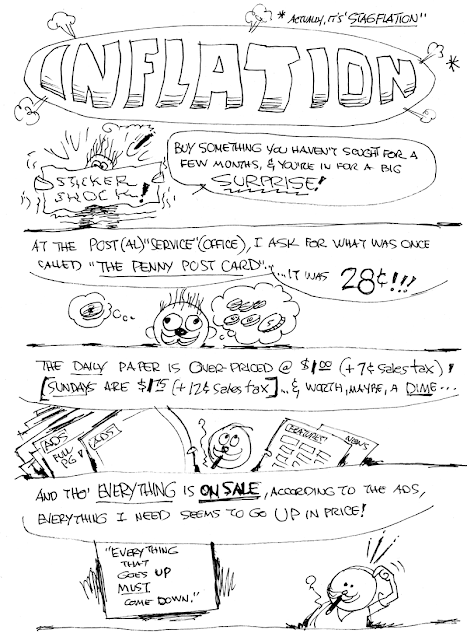 I found a run on NewspaperArchive, very spotty on a paper that appeared daily, but only had a full page of strips every week. Except for one week, where they had two. It also looks as if they did do a regular paer on Sunday, but none of wednesday. I didn't clip the name, because a 1941 search of Nordley will get you (or me) there. Here is some recent correspondence from researchers. I was unable (or in the last case, too lazy) to help these folks. Can anyone provide sustenance for these hungry minds? 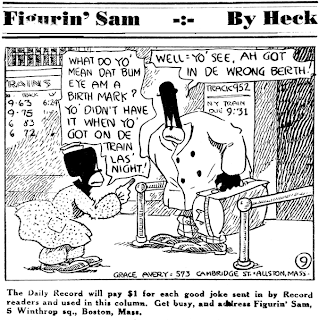 I'm still researching about Robert McCay, found out many interesting details, but nothing about the strip HIS JOB. I've only got three samples from Peter Maresca. Do you think you could post a 'Please help' call on your website? Anybody out there being aware of any strips, dates, newspapers, etc.? I don't want you to do my homework, but I really don't know how to reach only 1/10 of the strip experts you can easily reach with your blog. I'm trying to find out more about the cartooning career of an early 20th century illustrator, Royal Roger Eubanks (born 1879). Our archives has just received a very large collection of letters and ephemera from a wealthy Cherokee family, one member of whom was briefly married to Eubanks. I'm familiar with his career as a book illustrator in the 1920s but I know next to nothing about his cartooning. He signed himself "R. Ubanx". At the turn of the century, 1902 or so, he was working for the Chicago Evening Journal. He may have had a larger business role than merely cartoonist. Family history connects him to something called the "Star Cartoonist Company." By 1910, following a divorce, he was back in his hometown in Oklahoma (he was a Cherokee), living with his parents. He listed his occupation on the census as "cartoonist." In 1920 he illustrated a collection of Native American folk tales called "Tales of the Bark Lodges." He also wrote some dialect tales of his own. He spent the later part of his life as a high school teacher in Berryville, Arkansas, dying in about 1955. How many "Hocus Focus" cartoons are known to exist? 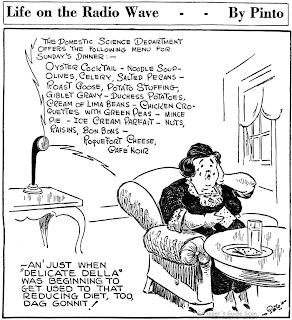 Life on the Radio Wave has twofold interest; an interesting early look at radio coming onto the scene, and a creator who went on to fame (but not as a cartoonist). 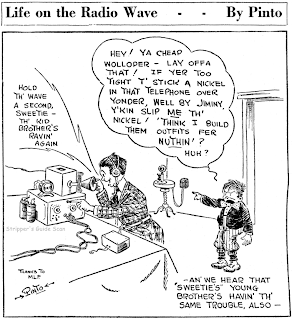 This panel feature ran 3-4 times per week in the San Francisco Chronicle from March 26 to August 26 1922, very early for a radio feature. 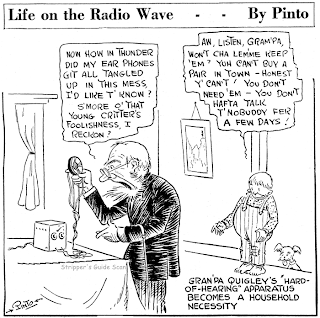 In fact as we can see from these samples the radio was still a homemade instrument at the time, and was being used as a telephone substitute in addition to it's better known role in home entertainment. 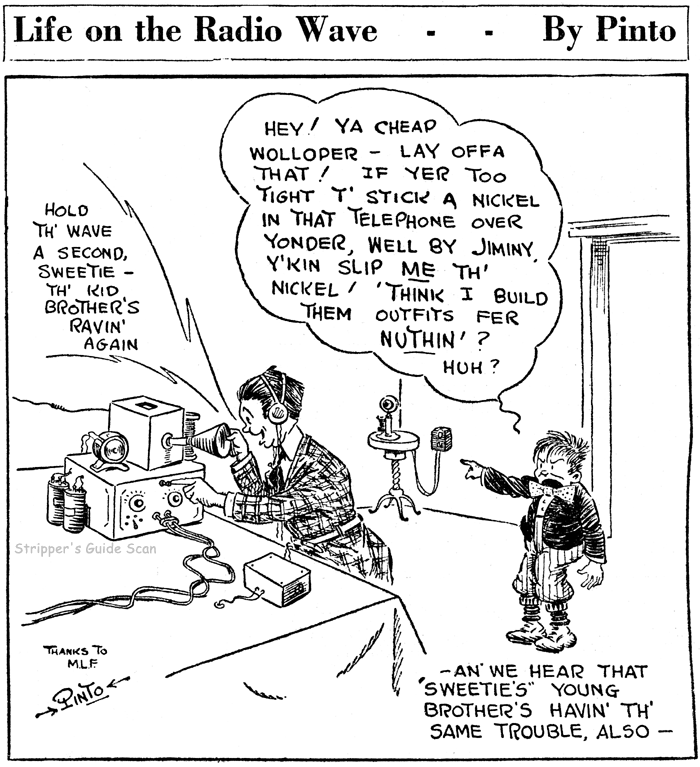 The cartoonist, who signed himself just 'Pinto' on the feature, was Vance DeBar "Pinto" Colvig. Colvig never hit the bigtime as a cartoonist, but he had other talents up his sleeve. He was a vaudeville actor, a clown, and ultimately made his mark as a voice actor for motion picture cartoons. He was Bluto in the Popeye cartoons, Pluto and Goofy for Disney, among other memorable roles. He even provided the voice for one of the Munchkins in The Wizard of Oz. He also has the distinction of being the very first Bozo the Clown, first on read-along records, then on television. Great blog! Thanks for posting. 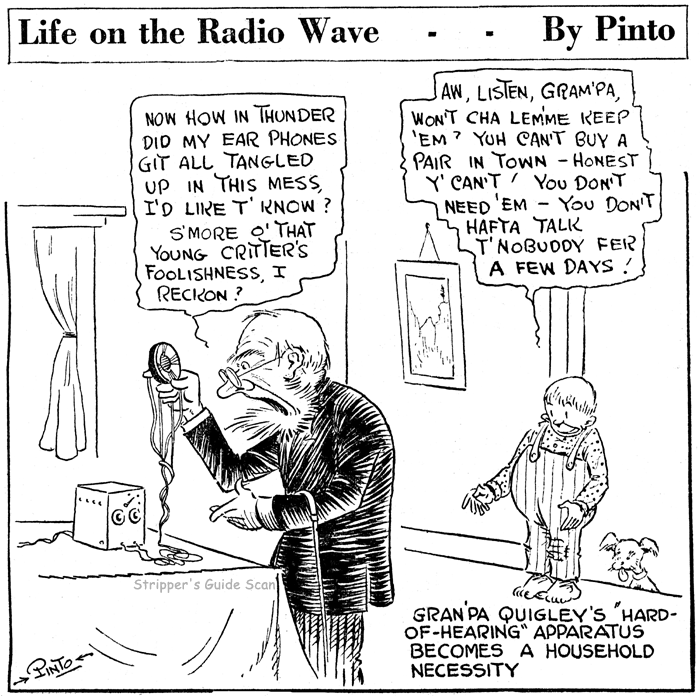 Love to see more of these Pinto cartoons from this series. Features that appeal to gamblers have enjoyed a minor popularity, mostly in the trashier tabloid papers. Many were horse-racing strips, but there were also numbers game features. 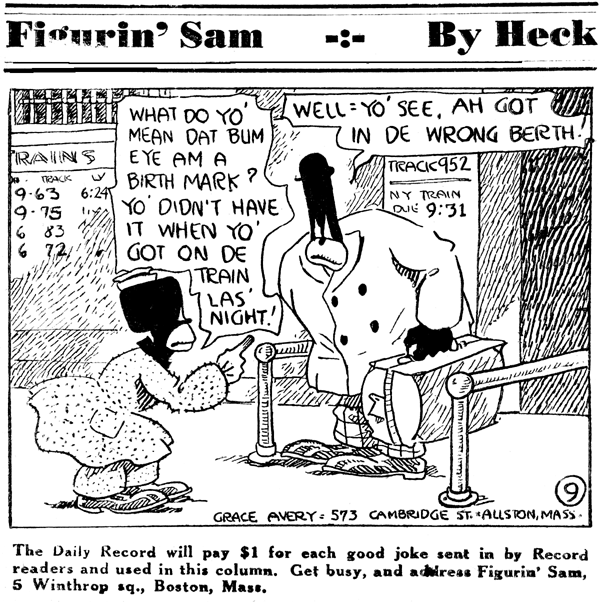 Why gamblers felt that some cartoonist in the newspaper's bullpen had some secret mystical ability to pick lucky numbers is beyond me, but apparently they did. 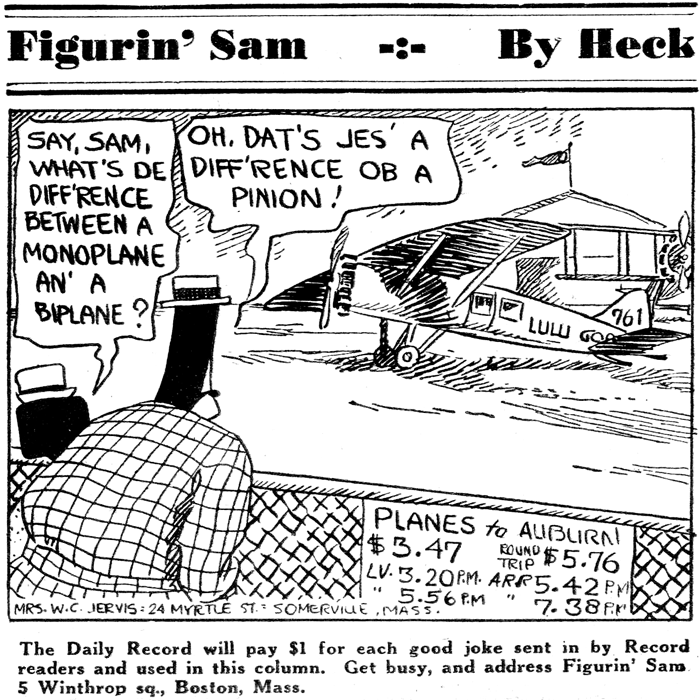 Figurin' Sam offered up a gag a day (submitted by readers) plus a whole slew of 'lucky' numbers cleverly placed in the background. It also offers a stereotypical depiction of blacks in perhaps its most elemental form -- our stars are little more than inkblots. 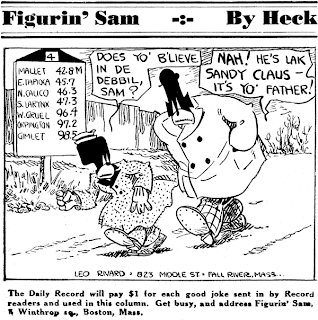 The feature was never signed, but in it's early days was bylined by 'Heck'; I have no idea if this was the cartoonist's real name. 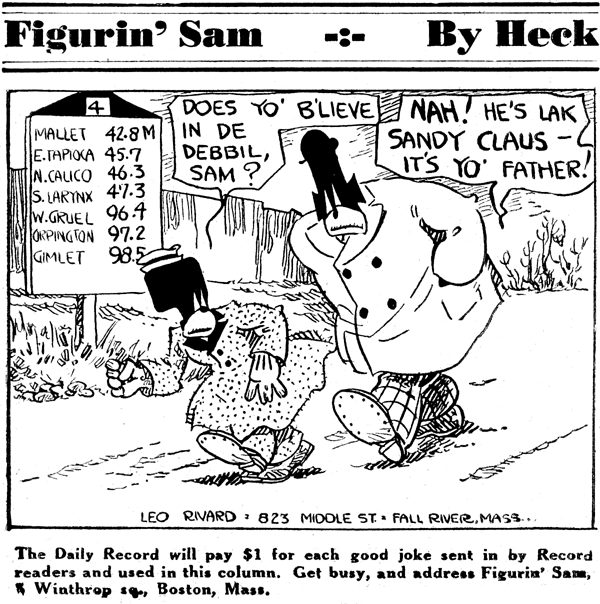 The feature began in 1930 in the Boston Record, and lasted until at least 1940 if not longer. Around 1932 the feature was demoted to one-column size and the byline was dropped. "What do you think of this? That doctor said he was going to treat me and now he sends me a bill!" "Sam, there's a machine out now that can tell when you're lying. Heard of it?" "Heard of it? Why, I'm married to one!" "Imagine, Sam! My uncle worked in a store for $3 a week and in five years he owned the store!" "Oh, I can believe that. They didn't have cash registers in those days!" Little Orphan Annie was a pop phenomenon in the 1930s the likes of which have seldom been seen. Kids, parents, the intelligentsia, the barely literate -- everybody loved plucky little Annie. And it really seemed to drive the Hearst folks crazy that they couldn't come up with an answer to Harold Gray's moppet. But oh how they tried. There was Little Annie Rooney, Big Sister and other pretenders to the throne. Although many of the Annie wannabees had long runs, none ever succeeded in grabbing more than a thread from her popular coattail. Which brings us to today's obscurity, Little Miss Muffet. This moppet shared a similar backdrop -- Millie Muffet started her comic strip life at a prestigious girl's school, where, on the very first day of the strip, she was informed that her parents seemed to have disappeared. Without the steady stream of dough to keep her in pinafores, the schoolmistress was all set to pack Millie off to an orphanage. Instead Muffet high-tailed it. Unlike Annie, though, Muffet had a knack for finding herself dependable benefactors. Rarely did Millie ever lack for pinafores or anything else. Her Shirley Temple looks and beatific personality usually had people practically fighting one another to take care of her. Little Miss Muffet ended up being sort of a genteel version of Annie. Sure there was drama, but seldom anything that would raise the pulse too far. However, unlike the stupendously dull Big Sister, this strip was a perfectly pleasant read. But the writing wasn't the strip's draw anyway. It was the incredible artwork of Fanny Y. Cory. Cory was a major illustrator around the turn of the century, but a husband, kids, and a Montana ranch to take care of had taken her out of the game. By the mid-20s, though, she was looking for work and got into doing newspaper cartoons. 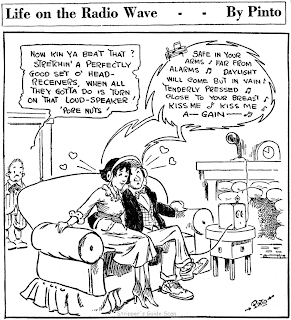 By 1935, when Little Miss Muffet began, she was already with Hearst, doing her Sonnysayings panel. From the sounds of it, Cory was offered the art chores on the new strip purely as a contract position. King Features staffers provided the scripts. In fact, Cory is on record at having chafed over the gentility of the writing, which is odd considering that her Sonnysayings panel was about as saccharine sweet as they come. Her disdain for the writing didn't slow her down though. The art on Little Miss Muffet is terrific stuff, with incredible attention to detail (for instance, note that Eph's checkered jacket is always hand-drawn, not a screen -- what a task!). 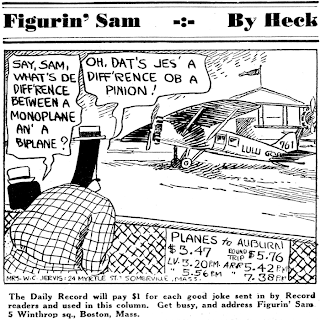 The strip began on September 2 1935, with only Cory credited. In 1940 a writer named Tecla Scheuring (surely not a pseudonym!) gained a writing credit for about six years. According to Cory's family she never did the writing except perhaps right at the bitter end. The strip ended on June 30 1956. Tecla A. Scheuring was born in Wisconsin around 1908 according to the 1910 U.S. Federal Census. She was the only child of Louis and Cecelia; the family lived on Miller Street in Anna, Illinois. Her father was an accountant. In 1920 the Scheurings lived in De Pere, Wisconsin. Scheuring lived at 428 St. James Place in Chicago, Illinois when the 1930 census was recorded. She was an office manager for an aviation corporation, and had a female roommate.